In 2010, Matthew J. George, a conductor of the University of St. Thomas Symphonic Wind Ensemble, proposed that I write a composition based on books and paintings by the Holocaust survivor Dr. Robert O. Fisch. The premiere took place in Minneapolis, in 2011, with the participation of Dr. Fisch himself; he read fragments from his books before each part of the suite and at the end of the composition. His paintings were demonstrated on a large screen during the performance. Dr. George even brought a dance ensemble for the performance! 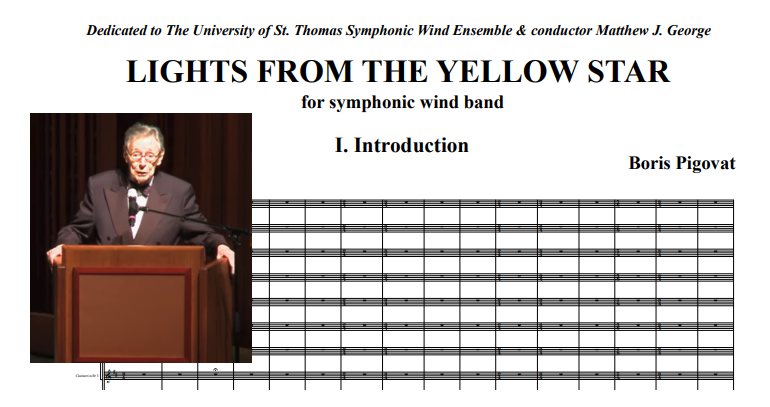 Later Matthew J. George and the University of St. Thomas Symphonic Wind Ensemble recorded Light from the Yellow Star, which was released in 2016 by the Innova label, as part of their album Persistence.